Sierra Copper is one of the copper specialty brands that Vintage Tub is proud to carry. These high style and utility products are simply works of art. Today, one of our friends at Sierra Copper visited us and we got a chance to learn more about these items first-hand. Frank, a representative for Sierra Copper, paid the Vintage Tub headquarters a visit this afternoon. This opportunity gave us the ability to discover amazing facts about everything and anything Sierra Copper. So, all of us here at Vintage Tub took this great opportunity to learn more about these copper masterpieces. All of Sierra Copper’s renowned copper products are hand crafted by their master artisans. Hammered to perfection, each Sierra Copper item is completed using traditional techniques to achieve the highest quality copper showpiece. Sierra Copper manufactures a wide range of products for the kitchen and bathroom. 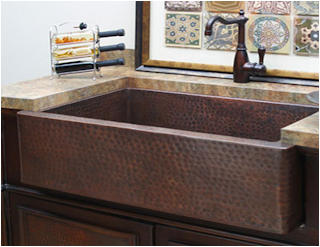 Some of their most popular pieces include farmhouse sinks, bathtubs, and vessel sinks. A variety of excellent copper finishes are sure to match any décor style from rustic to modern. Also, any Sierra Copper product can be easily customized for a truly unique addition to your home.